“Six Terrifying Graphs That Summarize America’s Public Pension Crisis” was a recent article that ranked state, county and city-level public pensions in the US by which are in the most trouble. 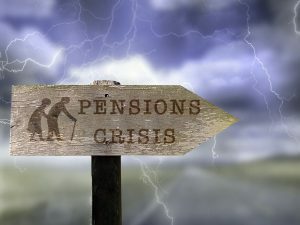 The study concluded that public pensions are currently underfunded by nearly $4 trillion, and that taxpayers in Illinois, California and New Jersey should probably move before getting drowned in their state’s coming pension-induced tax-hike tsunami. Pension underfunding will worsen over coming decades as the world contends with a wave of retiring baby boomers and lackluster, volatile returns. How bad could the global funding gap get? The World Economic Forum (WEF) says the answer is about $400 trillion—give or take a couple of trillion. Not surprisingly, the WEF attributed their conclusion to an aging population, lack of savings, low expected growth rates and financially illiterate citizens. Of course, ignoring the 20-year increase in life expectancy over the past 60 years without raising retirement ages will take a toll on the present value calculations of future liabilities. As well, politicians who created massive Ponzi schemes to promise citizens that their government would take care of their financial needs, while never bothering to explain the true costs of such programs, was a bad idea. But luckily these politicians are exempt from being prosecuted for their financial crimes, so taxpayers will just have to deal with picking up the $400 trillion tab.